Track List:HEINEKEN COMMERCIAL SONG.LYSISTRATA.I DONT WANT TO TIE YOU DOWN.96 TEARS.BORN TO SYNTHESIZE (WITH A TWIST VERSION).CLICHE. 'THE RACE TO THE BOTTOM' (POLITICAL COMMENTS).BLACK & WHITE.BLOW ME.VIKING SONG.COMPASSION. TOO FAR GONE.IT WOULDN'T HAVE MADE ANY DIFFERENCE.PATCHES.LOVE OF THE COMMON MAN.I SAW THE LIGHT (WITH A TWIST VERSION).LORNE GREENE SEGMENT. 'ABOUT REQUESTS'(COMMENTS).THERE GOES MY INSPIRATION.DETERMINATION.PAST.THE WHEEL.ONE WORLD. Track List:REAL MAN. LOVE OF THE COMMON MAN. BUFFALO GRASS. KINDHEARTED WOMAN. DETERMINATION. LUCKY GUY. CAN WE STILL BE FRIENDS. ESPRESSO (ALL JACKED UP). LOVE IS THE ANSWER. IT WOULDN'T HAVE MADE ANY DIFFERENCE. ENDLESS PRAIRIE (LORNE GREENE COVER). LOST HORIZON. FLAW. SOUL BROTHER. I'M SO PROUD/OOH BABY BABY/LA LA MEANS I LOVE YOU. I WANT YOU. HAWKING. I SAW THE LIGHT. COURAGE. DRIVE. COULDN'T I JUST TELL YOU. HELLO IT'S ME. A DREAM GOES ON FOREVER. Track List:REAL MAN.COMMON MAN.BUFFALO GRASS.KIND HEARTED WOMAN.DETERMINATION.LUCKY GUY.CAN WE STILL BE FRIENDS.ESPRESSO.LOVE IS THE ANSWER. IT WOULDN'T HAVE MADE ANY DIFFERENCE.ENDLESS PRAIRIE.LOST HORIZON.FLAW.SOUL BROTHER.SOUL MEDLEY.I WANT YOU.HAWKING.I SAW THE LIGHT.COURAGE.DRIVE.COULDN'T I JUST TELL YOU.HELLO IT'S ME.A DREAM GOES ON FOREVER. Track List:REAL MAN/LOVE OF THE COMMON MAN.TODD TALKS.BUFFALO GRASS.TODD TALKS.KIND HEARTED WOMAN.DETERMINATION.LUCKY GUY.CAN WE STILL BE FRIENDS.TODD TALKS.ESPRESSO.TODD TALKS.LOVE IS THE ANSWER.IT WOULDN'T HAVE MADE ANY DIFFERENCE.ENDLESS PRAIRIE.LOST HORIZON.TODD TALKS.FLAW.SOUL BROTHER.I'M SO PROUD/ OOH BABY BABY/I WANT YOU.HAWKING.I SAW THE LIGHT.COURAGE.COULDN'T I JUST TELL YOU.CROWD~ENCORE BREAK. Track List:DISC ONE: REAL MAN.LOVE OF THE COMMON MAN. BUFFALO GRASS. KIND HEARTED WOMAN. DETERMINATION. LUCKY GUY. CAN WE STILL BE FRIENDS. ESPRESSO. LOVE IS THE ANSWER. IT WOULDN'T HAVE MADE ANY DIFFERENCE. ENDLESS PRAIRIE. LOST HORIZON. SOUL BROTHER. DISC TWO:I'M SO PROUD. OOH BABY BABY/I WANT YOU.HAWKING. I SAW THE LIGHT. COURAGE. COULDN'T I JUST TELL YOU. CROWD.HELLO IT'S ME.DREAM GOES ON FOREVER. Track List:CD ONE: INTRO.THERE GOES MY INSPIRATION. TALK. LYSISTRATA. TALK. BIG WEEKEND. TALK. BORN TO SYNTHESIZE. PRAIRIE INTRO. ENDLESS PRAIRIE. LORNE GREENE TALK. IT WOULDN'T HAVE MADE ANY DIFFERENCE. TALK. TOO FAR GONE. SONG OF THE VIKING. COMPASSION. CD TWO: FADE IN. BLACK & WHITE. TALK. CLICHE'. TALK. GOOD SHIP VENUS. I DON'T WANT TO TIE YOU DOWN. TALK. I SAW THE LIGHT. TALK. HAWKING. Track List:FIRST SET: CROWD/TUNING. FLAMINGO. PROPERTY. GOD SAID. LOVE OF THE COMMON MAN. PRETENDING TO CARE. HELLO IT'S ME. THE SMELL OF MONEY. IF I HAVE TO BE ALONE. ONAMOTOPIA (SLOW). ONAMOTOPIA (FAST). BAG LADY. WE GOTTA GET YOU A WOMAN. INTERMISSION. SECOND SET: CROWD. MAMMON. FACIST CHRIST. WAILING WALL. CAN WE STILL BE FRIENDS. I SAW THE LIGHT. OUTRO/ENCORE/APPLAUSE. RETURN TO THE STAGE. WE GOTTA GET YOU A WOMAN (ENCORE). CROWD. Track List:MATCHBOX. IT DON'T COME EASY. WINGS. HELLO IT'S ME. EVIL WAYS. ROSANNA. KYRIE. DON'T PASS ME BY. BANG THE DRUM ALL DAY. BOYS. YELLOW SUBMARINE. BLACK MAGIC WOMAN.ANTHEM. I'M THE GREATEST. YOU ARE MINE. AFRICA. EVERYBODY'S EVERYTHING. I WANNA BE YOUR MAN. I SAW THE LIGHT. BROKEN WINGS. HOLD THE LINE. PHOTOGRAPH. ACT NATURALLY. WITH A LITTLE HELP FROM MY FRIENDS/GIVE PEACE A CHANCE. Track List:(cuts in)MATCHBOX . IT DON'T COME EASY. WINGS.I SAW THE LIGHT.EVIL WAYS.ROSANNA.KYRIE ELEISON.DON'T PASS ME BY.BANG THE DRUM ALL DAY.BOYS.YELLOW SUBMARINE.BLACK MAGIC WOMAN.TODD DOES THE BAND INTROS.ANTHEM.I'M THE GREATEST. ROCKY MOUNTAIN WAY.YOU ARE MINE.AFRICA.EVERYBODY'S EVERYTHING.I WANNA BE YOUR MAN.LOVE IS THE ANSWER.BROKEN WINGS.HOLD THE LINE.PHOTOGRAPH.ACT NATURALLY.WITH A LITTLE HELP FROM MY FRIENDS . GIVE PEACE A CHANCE. Track List:DISC ONE: MATCHBOX . IT DON'T COME EASY. WINGS.I SAW THE LIGHT.EVIL WAYS.ROSANNA.KYRIE ELEISON.DON'T PASS ME BY.BANG THE DRUM ALL DAY.BOYS.YELLOW SUBMARINE.BLACK MAGIC WOMAN.DISC TWO: BAND INTROS / HAPPY BIRTHDAY RINGO.ANTHEM.I'M THE GREATEST.ROCKY MOUNTAIN WAY.YOU ARE MINE.AFRICA.EVERYBODY'S EVERYTHING.I WANNA BE YOUR MAN.LOVE IS THE ANSWER.BROKEN WINGS.HOLD THE LINE.PHOTOGRAPH.ACT NATURALLY.WITH A LITTLE HELP FROM MY FRIENDS / GIVE PEACE A CHANCE. Track List:INTRO/POOR BOY LONG WAY FROM HOME. IT DON'T COME EASY. WINGS. I SAW THE LIGHT. EVIL WAYS. ROSANNA. KYRIE. DON'T PASS ME BY. BANG THE DRUM ALL DAY. BOYS. YELLOW SUBMARINE. BLACK MAGIC WOMAN. BAND INTROS. ANTHEM. I'M THE GREATEST. JOE WALSH INTRO. ROCKY MOUNTAIN WAY. YOU'RE MINE. AFRICA. EVERYBODY'S EVERYTHING. I WANNA BE YOUR MAN. LOVE IS THE ANSWER. BROKEN WINGS. HOLD THE LINE. PHOTOGRAPH. ACT NATURALLY. WITH A LITTLE HELP FROM MY FRIENDS/GIVE PEACE A CHANCE. Track List:DISC ONE: CROWD. BAND ONSTAGE. FRIDAY. LYSISTRADA. BLACK & WHITE. THERE GOES MY INSPIRATION. BIG WEEKEND. BORN TO SYNTHESIZE. SQUIDBILLIES. IT WOULDN'T HAVE MADE ANY DIFFERENCE. SONG OF THE VIKING. TOO FAR GONE. ENDLESS PRAIRIE. I'M A GUN (LORNE GREENE). DISC TWO: LOVE OF THE COMMON MAN. PISSIN'. CLICHE. BLOW ME. PAST. I SAW THE LIGHT. DETERMINATION. ONE WORLD. ENCORE APPLAUSE. BAND INTRO. THE WHEEL. CROWD. Note:Good audience recordings (both of them), but they sound from a 'distance'. Another ‘Unpredictable’ show that even though electric guitars are present; it seems very much acoustic ‘unplugged’ performance. As Todd continues this humorous show, the audience is a little quiet (for Cleveland!). Track List:DISC ONE: CROWD. JAAN PEHECHAAN HO. CLICHE. ONE WORLD. 96 TEARS.I DON'T WANT TO TIE YOU DOWN. SONG OF THE VIKING. IT WOULDN'T HAVE MADE ANY DIFFERENCE. TOO FAR GONE. PATCHES. LOVE OF THE COMMON MAN. ENDLESS PRAIRIE. I'M A GUN. DISC TWO: BLACK & WHITE. PA PROBLEMS. YOU'RE SO VAIN. SQUIDBILLIES. PAST. HELLO IT'S ME. HELLO IT'S ME (AGAIN). PISSIN'. LYSISTRATA. AUDIENCE. BAND INTROS. BORN TO SYNTHESIZE. I SAW THE LIGHT. AUDIENCE. 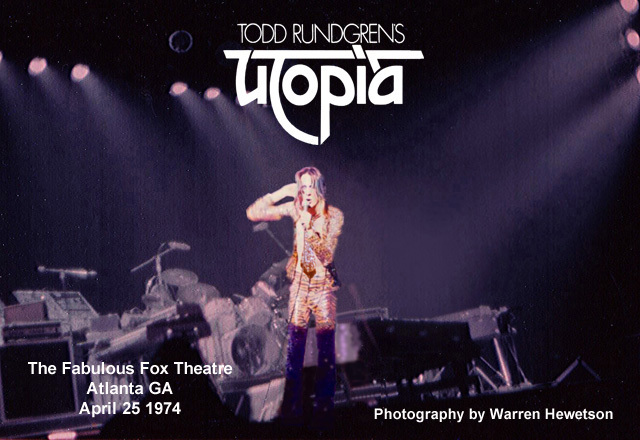 Note:The second night of the 'Unpredictable Todd Rundgren' themed sets. This audience recording seems from a better spot in the Venue. Very little audience chatter and all instruments and vocals very much up front. Makes for a very good capture. Set is strikingly similiar to the March 12th City Winery New York show. Rumor has it, at this point, that Todd's knees just ain't what they used to be (from all those leaps & bounds for 40+ years) and he limits himself to the bar stool thru-out these recent appearances. Rightfully so. The best out of the Agora recordings by far! Thank you Jon babcock for getting us this one too!~ Warren. Track List:DAN HARPLE INTRO.I DON'T WANT TO TIE YOU DOWN.LOVE OF THE COMMON MAN. COMPASSION. BANG ON THE UKULELE.FLAMINGO/ZEN ARCHER/LORD CHANCELLOR’S NIGHTMARE SONG.MAN NA MAN NA/MERCENARY.SOUL BROTHER.COURAGE.BLACK MARIA.PRETENDING TO CARE. STOOD UP. Track List:MARY & THE HOLY GHOST (W/MEGAPHONE).ANOTHER LIFE.HELLO IT'S ME.PRETENDING TO CARE.PROPERTY.FROGS.SECOND WIND.FLAMINGO.IF I HAVE TO BE ALONE.LOVE IN DISGUISE (W/MATILDA SANTING).WAILING WALL.LOVE SCIENCE.MAMMON/FACIST CHRIST.I SAW THE LIGHT.FADE AWAY.FROGS (REPEATED).BAG LADY.WE GOTTA GET YOU A WOMAN.CAN WE STILL BE FRIENDS. Note:Flawless audio from the TRradio Webcast on 11/11/2012. Brought to us recorded by Istvan. Thank you my friend! "Some say that it's never as good second time around! I beg to differ. At least on the evidence of Todd Rundgren and the Metropole Orchestra Part 2 I most certainly differ! My weekend began on Friday flying in to Amsterdam around lunchtime and going through the 'Quid Pro Quo' of the Amsterdam shopping expedition as negotiated with my good wife. Saturday evening began with a pretty tasty Surf & Turf in an Argentinean Restaurant before we made our way to the fan gathering at De Doffer. Was great to encounter some old friends and to make some new ones at the gathering. I unfortunately left before TR arrived but as I had run in to him at the hotel earlier and had a short chat I wasn't too put out. Thanks to Jill Mingo and others from arranging a wonderful curtain raiser for the main event! On to Sunday and the anticipation was rising as the evening approached. The one drawback about having the gig in Amsterdam is that the Dutch are probably the tallest race in Western Europe and when you are somewhat vertically challenged like me it is probably a good idea to get in early to secure a vantage point. Luckily my good friend Robznl had secured a raised position which afforded us a pretty decent view over the heads of the towering audience. The concert began a little behind schedule but not long after 8.30pm the orchestra were seated and began 'Mary and the Holy Ghost' while Todd appeared on the balcony resplendent in a bright red tux, using a megaphone! A pretty unexpected beginning and if that was surprising then what came next was pretty sensational. I could scarcely believe my ears as the brass section of the orchestra launched in to the opening riff of 'Another Life'. Wonderfully orchestrated and benefitting from the inclusion of three backing singers this was a supreme performance by artists at the top of their game. Todd was in brilliant voice and launched immediately in to 'Hello It's Me' which was a repeat of last years performance but possibly better with the addition of the backing singers. 'Pretending To Care' followed again performed impeccably before the orchestra rocked out with 'Property'. Next up was our 'world premiere' of 'Frogs'. Todd explained the origin of the song and how it had been commissioned but never used by the Bath Festival. The song obviously lends itself to orchestration and was performed (almost) flawlessly, Todd missing a lyric or two! As you may gather things were going rather well and things stayed at that level when the familiar strains of 'Second Wind' drifted across the room. Again the arrangement was top notch, the paying impeccable and Todd's voice in tip-top shape. And again the backing vocals added so much to this performance. I'm not sure why we needed an intermission at this point. Maybe it was something to do with the radio scheduling but a break we had and when the Metropole reappeared Todd took to the stage with guitar in hand to perform 'Flamingo'. Next up were perhaps my favourite songs of the evening. Both from 'Up Against It' TR first performed 'If I Have To Be Alone'. Once again Tom Trapp's arrangement is first class. The string section driving the song along beneath a sublime Todd vocal. The promised duet 'Love In Disguise' followed with Matilde Santing taking the female lead and doing a damned fine job of it while TR nailed the male lead and both were superbly supported by the other male and female backing singers. Truly sublime. Back to more familiar territory with 'Wailing Wall' featuring a fine horn solo before the pace was cranked up with a wonderful 'Love Science'. A Special word for the rhythm and percussion section on this one. They were absolutely incredible and really got everyone in the audience rocking. We had a reprise of Mammon/Fascist Christ from last year keeping the hall rocking, the latter featuring some searing guitar work from TR. Todd kept the guitar on for a singalong 'I Saw The Light' before ending with a truly wonderful 'Fade Away'. Once again a song which lends itself to orchestration and wonderfully performed by composer, backing singers and orchestra. Worth the trip alone I think! This was the last number of the evening but of course there would be encores. First up was another attempt at 'Frogs' which TR acknowledged he had goofed up on the first time around. This time was pretty similar but as TR said "At least we goofed up in different places!!" The last three tunes we had heard last year but that didn't diminish the impact or the enjoyment. 'Bag Lady' featured a beautiful trombone solo, 'We Got To Get You A Woman' really lends itself to the big band/orchestra genre and the closer 'Can We Still Be Friends' had everyone singing along carried along on a euphoric wave of sheer joy! Special word again for the Backing vocals on this one which again took the arrangement to another level. ! Presentations made the principals left the stage but the crowd were going nowhere. The applause and cheering continued for several minutes, maybe 10! The orchestra didn't know whether to stay or go and it looked for a while like we may get them back again. Alas it was not to be and we had to settle for what had gone before but I don't think a single person went home disappointed. This gig goes straight in to my Top 5 of all time and at this point I'm struggling to think of one that beats it! It was THAT good!